Click on the banner above for a look back at some of the PCO’s recent artists of the month. PCOer Ian Ellery alerts us to the work of Chinese cartoonist Coco Wang who is reporting on the earthquake in her country. Comics historian and teacher, Paul Gravett is hosting some of her still, narrative reports here. An unlikely new trend appears to be emerging in the world of film: animated movies for grown-ups. Hot on the heels of the likes of A Scanner Darkly and Persepolis, comes Waltz with Bashir, which was in competition at the recent Cannes Film Festival. See the trailer above. It’s billed as an “animated documentary”, as the Writer and director Ari Folman uses animation to depict his haunting but vague recollections of the 1982 Israeli Army invasion of Beirut which he took part in, incorporating also the memories of an old friend. As film writers would no doubt say: Ratatouille, it ain’t! But it’s fascinating to see this medium used in this way. Artist Beryl Cook, a painter with a cartoonists’ sensibility for accurate observation from life, has died. The The BBC has a slideshow of her images here which are from a gallery exhibition for her 80th birthday made in 2006. There are also formal obituaries from the Telegraph and the Guardian as well as a short piece about her pictures of women at play. This morning, a BBC Radio5Live feature ran a feature on child pornographers using drawings to avoid the law on the distribution and viewing of obscene photography. The presenter described such images as ‘cartoons’. Perhaps he meant drawings or simple visual communication, or even art, but to be honest, the feature was so badly constructed it was difficult to know exactly what was meant. However, the casual use of the term cartoon felt like the denigration of a trade; cartoon equals grubby, worthless, evil. Clip available – 2hrs 22 minutes into Radio5Live for Wednesday morning – 28th May 2008 available on the BBC’s IPlayer. 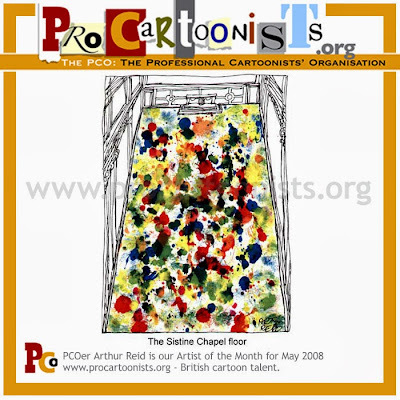 Here is our last portfolio piece from Arthur Reid, our cartoonist of the month for May 2008. Bloghorn runs examples of artwork from the PCO’s membership every Friday morning. Please note that the PCO’s members’ portfolio website is currently down for technical work. We will have it online again soon. Apologies for any inconvenience. UPDATED: Friday 23rd May. The folio site is now back online – apologies for the inconvenience. The Cartoon Museum has a series of evening events lined up to accompany its exhibition Pont – Observing the British at Home and Abroad, which was reviewed here last week. Pont – the Making of a Humorous Artist, June 5: Illustrated talk with Anita O’Brien, discussing the evolution of Pont’s style from his drawings of the early 1930s to his wartime work. Pont of Punch, June 19. Former Punch archivist and Cartoon Museum trustee Amanda-Jane Doran looks at Pont as a Punch artist. 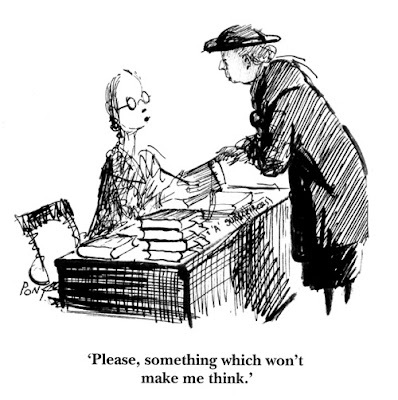 In Praise of Pont – Cartoonists’ Roundtable, June 26: A host of cartoonists join Richard Ingrams to discuss the wit and artistry of Pont. The panel includes Steve Bell, Peter Brookes, Nicholas Garland, John Jensen, Nick Newman and Posy Simmonds. Graham Laidler, The Man Behind Pont, July 3: Simon Booth reveals more about the short but eventful life of Graham Laidler, aka Pont. For full details on times and ticket prices, visit the Cartoon Museum website. A retrospective exhibition of the cartoon art of Dave Follows is now on in his hometown of Stoke-on-Trent. 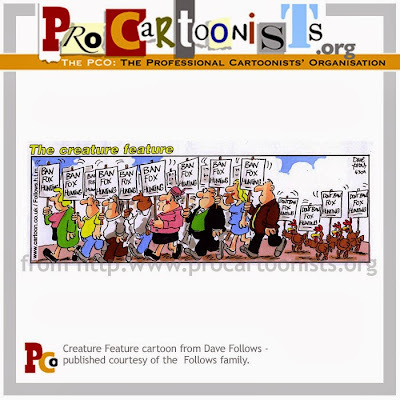 There is a wealth of detail about Dave’s long career in drawing here and many examples of his best-known work – including The Creature Feature – a cartoon strip which ran in the Sunday Times newspaper (and many other papers) for more than a decade. 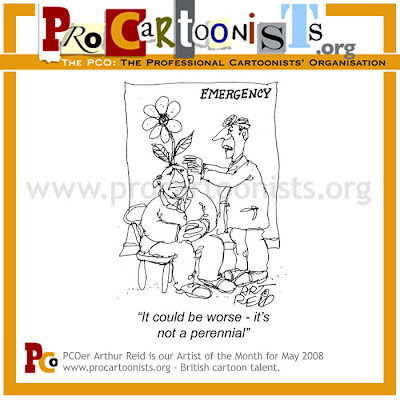 Here’s our third cartoon from Arthur Reid, PCO Artist of the Month for May 2008.